Previous Post Meet your new friends: Undo & Redo. 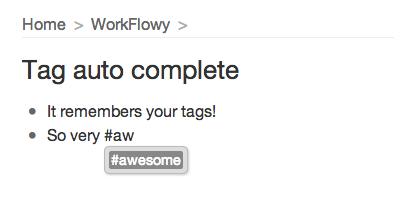 Next Post WorkFlowy Mobile: Simpler, Easier Editing. Will this be added to the iOS app? I think it would make working on a mobile app so much faster. Plus it will stop me from misspelling # words! Auto-complete suggests tags you’ve deleted. How can I stop this? I don’t want tags that I don’t use any more to still be suggested. How do I clear the unused tag from popping up?